I'm a little bit surprised raocow's never actually lped one of those yet. It's not his usual genre of game but they're the exact sort of ridiculous he likes. So I think I mentioned this game a while back, but a friend of mine kickstarted this singing adventure game called Wandersong back in 2016 and it just released last week on Steam and the Switch. I haven't gotten around to playing it myself yet, but it seems like the game's getting good reviews and my brother's been having a lot of fun with it. Last edited by Rockythechao on 11 Oct 2018, 21:39, edited 1 time in total. So Iji apparently got two new endings early last year. I might be way behind the curve here, but any plans to pick Iji back up to do them at some point? I mentioned that in the original Iji topic. But the biggest change is the Pacifist weapons. This changes the strategy away from "Take rockets to the face and kill everyone with splash damage"
I've posted about Massimo here before, but don't think I did it justice describing it. This hack is an underated gem, and a lot of people seem to overlook it, because of certain reasons. There's only 1 other LP of it on youtube, which is mostly negative about the game. It has a really empty and errie atmosphere to it, which the music helps with tons. It plays more of like a metroidvania type game, or puzzle game, than it does a traditional platformer, but it does contain a bit of platforming. It's also pretty short I belive. I dunno, I could just be wearing nostalgia goggles, but I think there's really something special here. mostly negative? can I ask why, do you think ? For mostly SMWCentral-y reasons I feel, like "there's cutoff" or "grammar errors". "too empty" may be a little true, but it works really well with the atmosphere the hack is aiming for. I think that its just something that needs a certain mind for appreciating. it's kinda one of those "experience" type things imo. It might not be for everyone, but for me, the whole atmosphere of the hack and low fidelity aesthetics really tickle my fancy. A more polished hack, that most people will agree is good is like a song you'd hear on the radio, high production value, more appealing to generally most people, where massimos sort of like some super niche genre like I dunno, harsh noise or something, that only the most hipstery hipsters would enjoy. 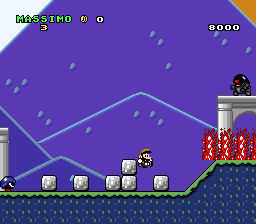 A SMW romhack called Massimo is a perfect choice to play alongside the AtMM series. 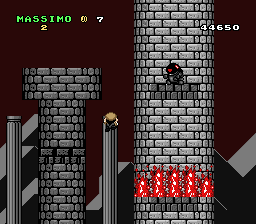 Oh yes, Massimo is one of the first SMW Rom Hacks that I played back then. It does play more like a Metroidvania than normal and it's unique in its own way. It's theme is dark and it has some good gimmicky stages as well. I haven't seen any playthroughs of this. No LPs, no Real-Time or Tool Assisted Speedruns and even no simple playthroughs. Too bad it was badly rated by SMW, but you may give this one a chance if you can rao. It's a fun, super fast-paced platformer where you teleport around really fast. It's also very short, I think you could beat it in 1 or 2 videos, assuming you don't get stuck in a difficult level. In each room, you must destroy certain blocks to progress to the next. There are cannons that fire homing missiles at you constantly. You can move and jump like in a normal platformer, but you can also use your focus power, which slows down time while you choose a spot to teleport to. That game was suggested early on in the grab-bag, and there was a resounding NO from everyone. I've played a little, and I agree, would not make a good LP. Sebby19 wrote: ↑ That game was suggested early on in the grab-bag, and there was a resounding NO from everyone. Huh, really? I understand that it's super boring to some people and I can see why some of them wouldn't recommend it, but there seriously weren't any fans defending it? A full lp of it would definitely drag on (not that there's really a goal anyways) but that's why I was suggesting it as an smaller extra thing. Smibbix wrote: ↑ Huh, really? I understand that it's super boring to some people and I can see why some of them wouldn't recommend it, but there seriously weren't any fans defending it? Doesn't that rely pretty heavily on dialogue? 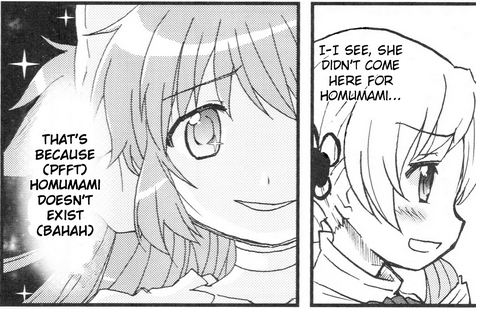 It'd be an awful choice for raocow to lp for the same reason rpgs are. He just speeds right through dialogue while paying the barest attention possible to it. For something filled with dialogue that'd be to the detriment of the lp.